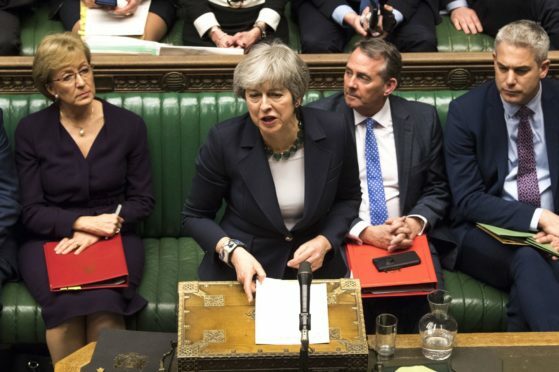 Prime Minister Theresa May during a Brexit debate in the House of Commons. Madam, – As we near the day when Scotland will be dragged out of the EU despite all our constituencies voting to remain, it might be interesting to note that the Leave vote was approximately 17.4 million, and Remain 16.1m. The total population of the UK is approximately 66.8m, of which 33.5m voted. In an earlier referendum on independence in Scotland, the non-voters were classed as acquiescent to the status quo. If the same rules applied now then millions of voters were supportive of staying in the EU. While the EU is not perfect, the best way to change it is to stay in and persuade other dissenting nations, of which there are some, that reforms are needed. The UK has in the past asked for, and been given, more concessions than any other member. Our response now is to throw the toys out” and go off in the huff. Phrases such as “Brexit means Brexit” or “delivering on the mandate of the 2016 referendum” can’t seem to solve the impasse in Westminster just now. Our prime minister is trying to force through the same deal, which has already been rejected by record defeats, in the hope the threat of no Brexit might persuade some dissenters to change their mind and support this dog’s Brexit of a deal. In all this May-hem, Scotland is continually being ignored, with our MPs shouted down. Madam, – When I voted in the May 2014 European elections, I didn’t expect that it would be the last poll of that kind. I didn’t expect the case for Scottish independence to be supported in the referendum later that year but I did expect the United Kingdom to remain a member of the EU. As a democrat I accepted the result of the plebiscite in June 2016 but, because of the narrow margin of victory for the Leave side, it seemed to me that the best way forward was for a ‘soft Brexit’. That surely meant the closest possible trading arrangements with the EU whilst retaining UK control of both laws and borders. In a difficult negotiation, indeed the walking of a political highwire, that is broadly what Prime Minister Theresa May managed to get from Brussels. She has failed, however, to look round all the political corners. She allowed her detractors– that uneasy coalition of Scottish Nationalists, hard line Ulster unionists, middle England 18th Century romantics and die hard Remainers on the Labour side – to seize the initiative. They are united only in the sense that they have no coherent alternative to what she has put forward. As a result, we may all be asked again to vote in European elections in May which might add to even further confusion. Supporting a slightly amended version of her deal is a way of ending uncertainty for business and those European citizens who have made their homes here. We won’t end debate about what Scotland and Britain will look like outside the EU. But we’ll at least have an idea of where we are, and a chance to restore the reputation of parliament and the political system. Madam, – There was a time when the map of the world had many areas coloured pink indicating that Great Britain was in political control of these countries. There are far fewersuch areas now and perhaps bright red would be an appropriate colour in view of the current lack of political control in this country. Theresa May is either a villain leading the country to ruin or a brave soldier continuing to seek a Brexit solution despite condemnation from friend and foe alike. Britain is no longer great and we now live in a disunited kingdom. Why is Westminster voting on how long an extension should be requested to Article 50? EU leaders have indicated quite clearly that the present deal is the only deal we are going to get and that there is no possibility of any further discussion of the subject. It is quite possible that the EU may refuse an extension. Madam, – In a no-deal scenario, chemistry would be one of the hard hit economic sectors, losing around a third of its £50bn contribution to UK plc. Thousands of people working in industry and academia are suffering with this uncertainty. While parliament has voted against leaving the EU without a deal, the government now has only 15 days to make this a reality and avoid crashing out. It is vital the government ensures a good deal for science and innovation that supports jobs and allows both academia and industry to maintain the UK’s world-leading position. Madam, – The police and members of Lochaber and Glencoe rescue teams do a magnificent job as they answer the call to aid those subjected to difficulty or injury out on our mountains. How they must feel with the recent tragedy on Ben Nevis, especially when climbers in treacherous conditions ignore warnings not to tackle a specific gully with a high risk of avalanche. Of course, naturally we feel sorry for those who have lost their lives. But this incident shows the difference between risk and irresponsibility. Madam, – We were pleased to note the call by Holyrood’s public audit committee for comprehensive research to be commissioned on the impact of social media on children and young people’s mental health, against a rising demand on services. Mental health referrals for children and young people increased by 22% over the five years to 2017/18, when 33,270 were made. This has included an increase in issues around emotional distress in young people at school arising from bullying, body image, depression and anxiety. There are links between unhealthy social media use and poorer mental wellbeing in children and young people, but we need to gain a better understanding of this. Education has a vital role to play in helping young people to use social media appropriately, including the pressures that can be associated with its use. It should be noted that many schools in Scotland are doing fantastic work. Preventative action and early intervention measures have key roles to play in addressing issues around children and young people’s mental health, and research on the impact of social media must play an essential part in this. Madam, – London Mayor Sadiq Khan is quoted as blaming knife crime on Tory austerity. I am sure that with a well-funded research programme, the Green Party could provide enough evidence for him to also blame it on climate change.